The line between Client and Friend can get very blurry sometimes. I've been so fortunate with all my clients that I feel they are my friends, too. It is my way to be friendly, but I must also be professional to serve you well. SPAM* (see below), bulk-email, and chain-letters/email, is familiar to all of us that have been on the Internet for even the shortest time. If you have been deemed to have engaged in SPAM from your web site, or your web site email accounts, your hosting service will be terminated. Due to service policies of external IT (Internet Technology) provider companies this termination is irrevocable. 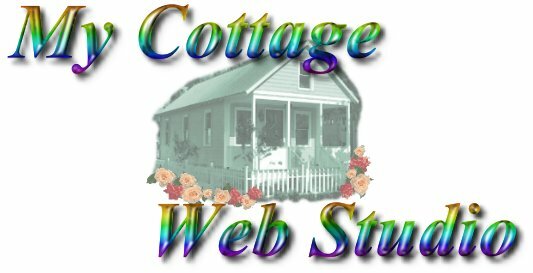 Further, I My Cottage Web Studio has designed your web site hosting on an external server, that's entirely your prerogative. However, My Cottage will remove it (SM) service mark on your page as your developer. You can be assured that we will not assist you in the SPAMMING of your business. Your business reputation and our reputation are so important to us that we will do all in my power to protect and preserve our integrity. If you have already heard my anti-SPAM recommendations and already understand the negative impact, you can stop reading here. If you've been tempted by the lure of bulk email promises of fast profit, thought about posting to every newsgroup known to man, or found a chain mail just too cute to refrain from passing along, you need to read below. WHY NO SPAM1, BULK EMAIL, ETC. 1.) Virginia has an anti-SPAM law. It's a felony and carries a stiff fine. Please refer to the following hyperlink. Other states will most likely follow. 2.) Seasoned Internet users can smell SPAM without even opening it. The DELETE button promptly eliminates you. 3.) Sophisticated email programs can block (filter) your email from being received anyway. 4.) Bulk email annoys potential clients. 5.) Bulk email annoys non-potential clients to the extreme. They will FLAME2 you, they will file complaints with their own and other servers, and if you get them really angry, they will report you to the FTC and FCC. 6.) My email is mostly for business, sometimes for pleasure. When I'm working hard for the growth of my business, or I'm "playing" because I need the relaxation, bulk email is annoying and offensive. The same is true for a majority of people you might SPAM. 7.) Despite the promises of fame and fortune, those that "make money" on bulk email are the ones selling the lists and the ones selling spamming software. Visitors are reluctant to sign-up for mailing list because of the sale of lists to bulk emailers. It's the "kiss of death," don't do it. 8.) If you are paying for email addresses that are not in your "target" group, you are wasting your money anyway. 9.) Anti-spam obsessed nerds will track you down and spread the word that you're a low-down-dirty-spammer. FLAMES spread quickly on the Internet. 10.) There are fewer and fewer unsuspecting newbies and so many people are afraid of viruses they won't open any email--even from people they might know. 11.) Multiple mass email requires "bandwidth" and slows the Internet. The result is a bottle-neck and slow down of email servers. Slowing down servers is NOT a good thing. 13.) Terms of Service on most membership hosts (AOL, Gmail, Yahoo, etc.) as well as even the smallest of Internet Service Provides (including My Cottage Web Studio) prohibit this activity. It will get your account shut down. There are legitimate ways to promote your web site and as my friends and clients we have either already implemented these techniques or discussed some of them to implement in the future. Some devious individuals will include a note in their bulk email that should you want to be removed from the email list you should click on the hyperlink. DON'T DO IT! It will simply confirm your email address as a valid place to send bulk email--and that is the BEST case scenario. It has the potential for being something much worse. Also, be on the lookout for an email that asks you to call a special phone number to be removed from the mailing list. The last one I saw was a long distance phone call to Grenada! Why should you pay a long distance bill to be removed from a list you never wanted to be on in the first place? Why, indeed? Some of these "off-shore" numbers are their own long-distance phone services and will charge you wildly outrageous prices for your connection! I haven't seen it all, but I've seen a lot--watch your step, please. SPAM* -- The history of this term is a bit of a mystery, but I've heard it referred to as an anagram for Soliciting Promoting Advertising and Merchandising. It's also been linked to Monty Python's "spam, Spam, SPAM and Spam" routine. There is nothing humorous about it. In a nutshell, it is unsolicited email or message posting. FLAME* -- This term refers to angry and extremely hostile email or message posting. It can be threatening, irrational, vulgar, and a lot of other unpleasant things. FLAMES are stressful to deal with.